Fuchsias should be covered with a blanket of bloom right now. Feed them often with a light, balanced fertilizer. When the individual flowers of most fuchsia varieties fade they fall off the plant, but they leave their seed pods still attached to the branch. Pinch off these seed pods, or berries as they’re often called, daily if possible after the flowers fall. This keeps the plants blooming. Water fuchsias regularly to prevent them from drying out, but don’t overwater. 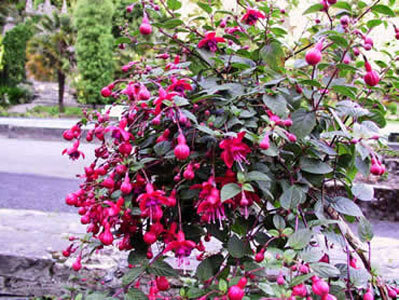 Soggy soil can lead to root rot, fuchsias’ worst enemy. In hot climates, the best location is a moist shady spot that has high humidity and cooler air temps. Be on the lookout for pests, and spray if necessary. Continue to introduce beneficial insects and encourage garden spiders. If these seem to be controlling most problems, don’t spray. Visit nurseries to pick out new fuchsia varieties now and you’ll have the summer and fall to enjoy them. Choose them according to the environment you’ll provide. White and pastel colors usually need more shade. Reds, purples, and small single varieties can usually take more sun. No fuchsia can bloom in solid shade; all need partial sun, such as under a lath, shade cloth, or an open tree. In hot-weather areas concentrate on growing heat-resistant varieties. Upright varieties are best in the ground or tubs. Trailers are best in hanging baskets.